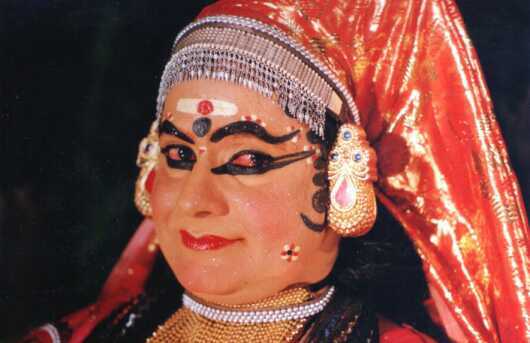 The make-up, called Chutty in the bibliography of Kathakali, is also an art form in itself. The colourful faces are the results of hours of painstaking handiwork by expert artists. Their work is, by no means subordinate to portrait painting. The basic materials used for the make up are very crude items like raw amorphous Sulphur, Indigo, Rice paste, Lime, Coconut oil etc. One of the major distinguishing features of Kathakali is the absence of oral communication. A considerable part of the script is in the form of lyrics, sung by vocalists. The only accompaniments are percussion instruments. Chenda (Drum played with sticks) Maddalam (Drum played with fingers), Chengila (Gong) and Ilathalam (Cymbals). The style of music traditionally accepted is Sopana, where the range is limited to one and half octaves. However, the influence of Karnataka Style of Classical Music has been irresistible, and the singers often take liberty with the style. It is not unusual that a Kathakali performance take the form of a Jugalbandi (Duet) of singing and acting. Drumming especially of Chenda is the salient feature of Kathakali. Formerly considered an "Asura Vadyam" meaning one that cannot go in harmony, Chena has become the most important feature. Artists are capable of producing a range of sounds varying from the gentle rattle of dry leaves in a breeze to reverberating thunder on Chenda. 1. Kerala Kalamandalam, Cheruthuruthy, Trissur District. 3. Unnayivarrier Smaraka Kalanilayam, Iringalakkuda, Thrissur District. 4. Gandhi Seva Sadanam, Pathirippala, Palakkad District. 5. Margi, Thiruvananthapuram, Thiruvananthapuram District. 6. R.L.V. Thripunithura, Ernakulam Dt. 8. Mudra Kathakali Centre, Kumily, Idukki District.